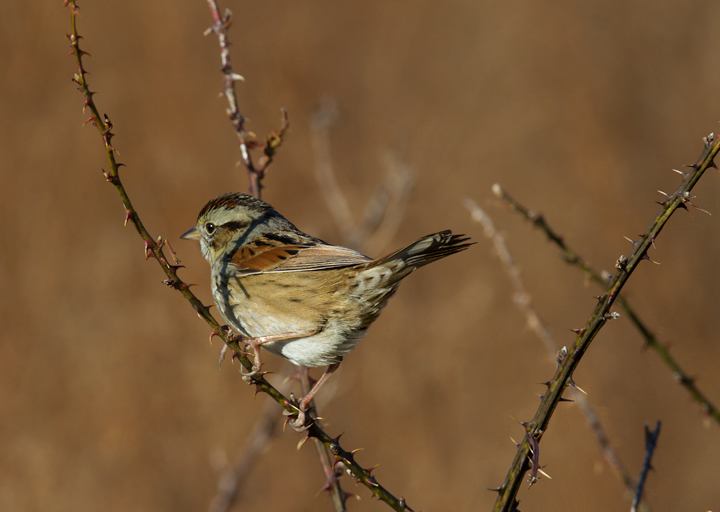 January in Maryland. 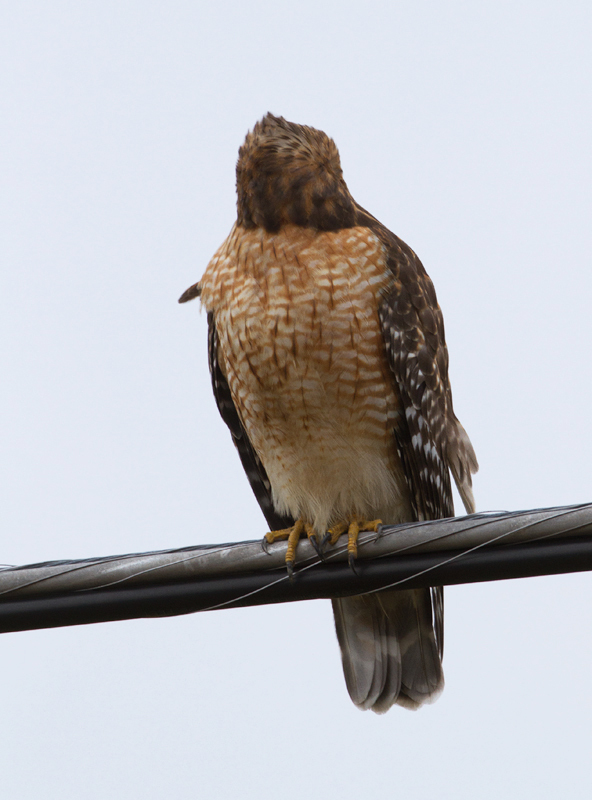 Last updated: 1/29/2012. 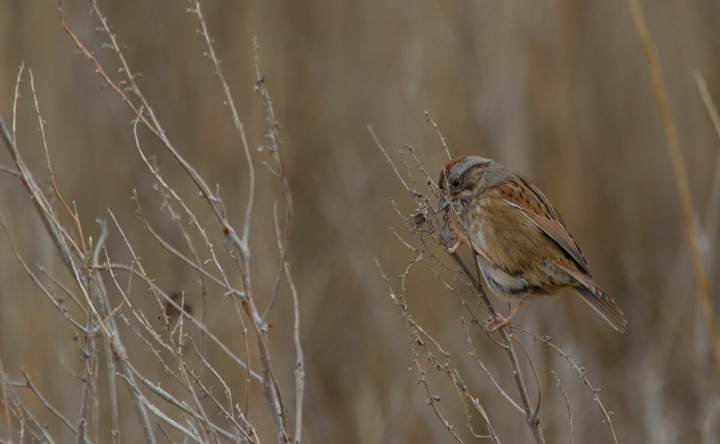 Above and below: A Swamp Sparrow in Worcester Co., Maryland (1/28/2012). 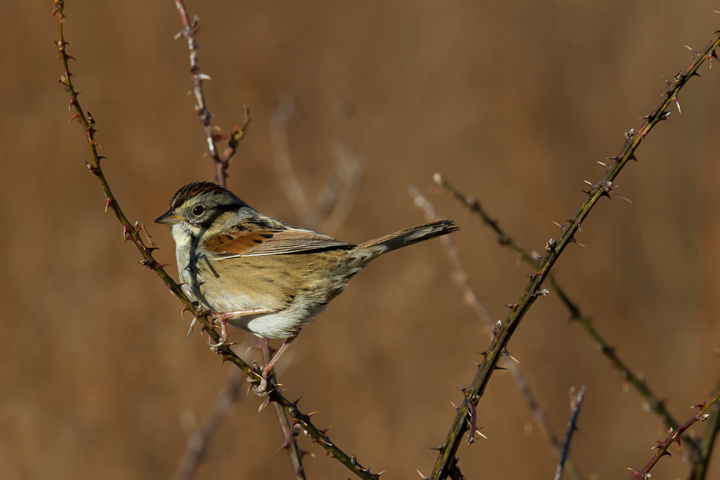 Below: A Swamp Sparrow at Fairmount WMA, Somerset Co., Maryland (1/22/2012). 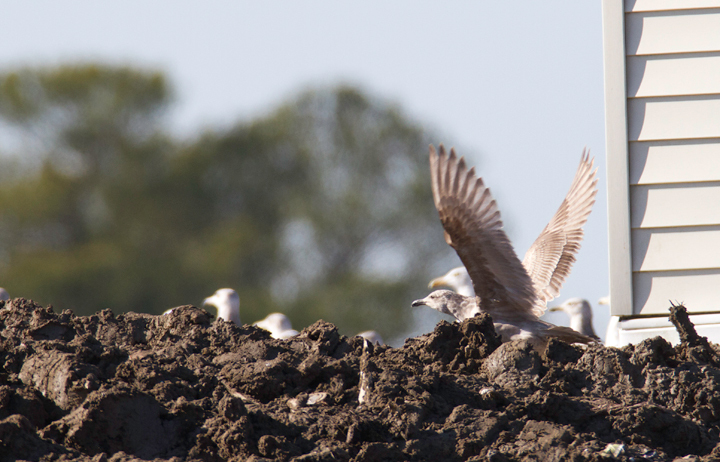 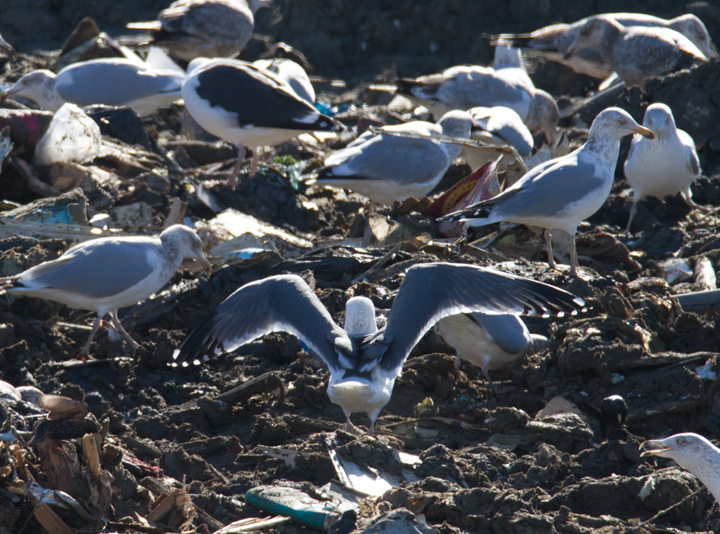 Below: A very interesting gull photographed at the Worcester Co. landfill, found by me, Mikey Lutmerding, and Dan Small on 1/28/2012. 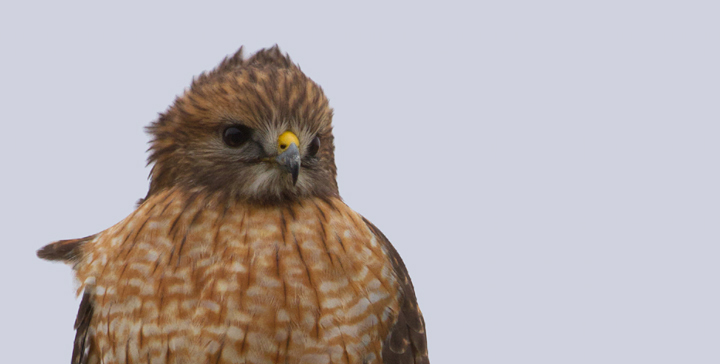 Click to view any image in full-size without any adjustments besides cropping. 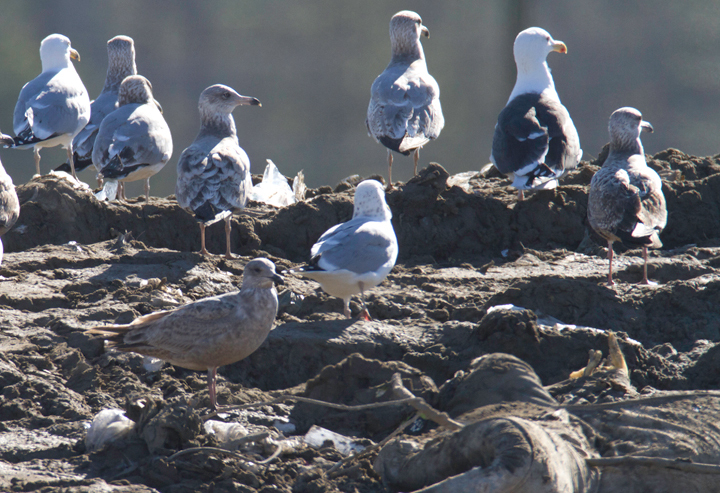 Shows some characters suggestive of first-cycle Slaty-backed Gull or perhaps Glaucous-winged x Herring Gull hybrid. 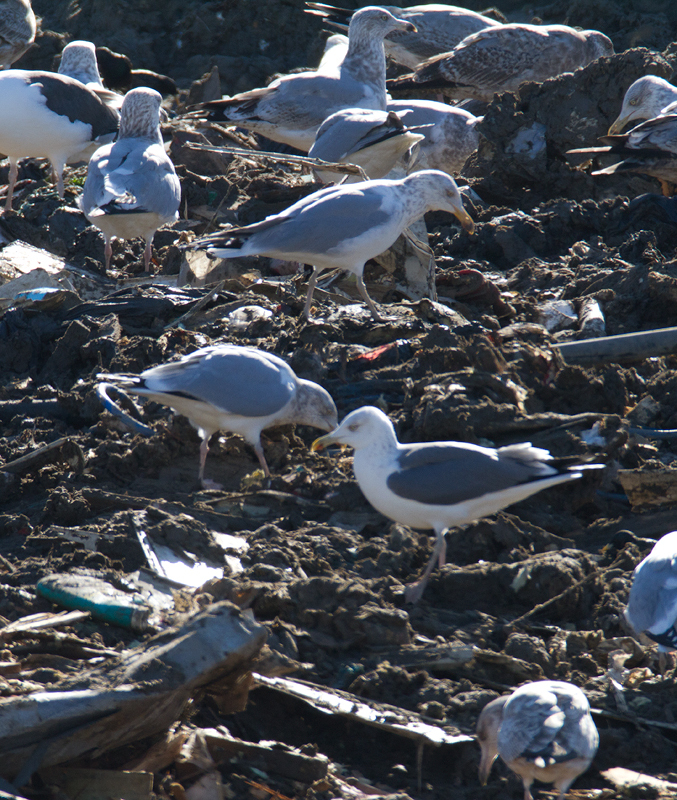 A notorious ID challenge that might be impossible to settle conclusively at this time. 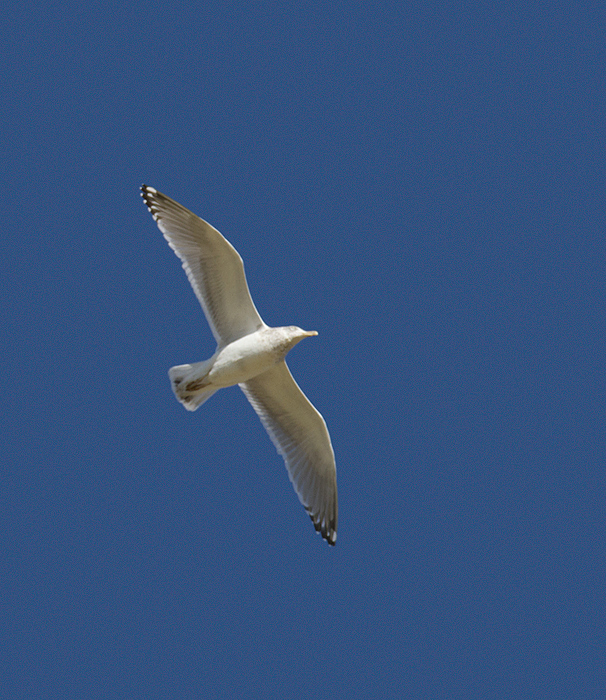 Opinions to the contrary are very welcome! 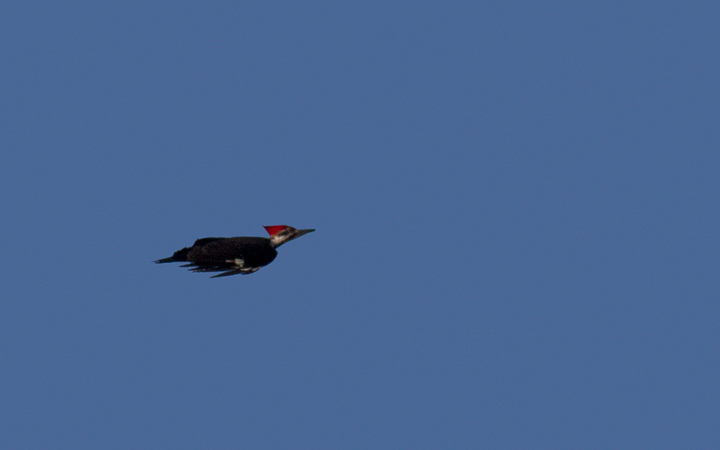 Below: A Pileated Woodpecker in flight over Worcester Co., Maryland (1/28/2012). 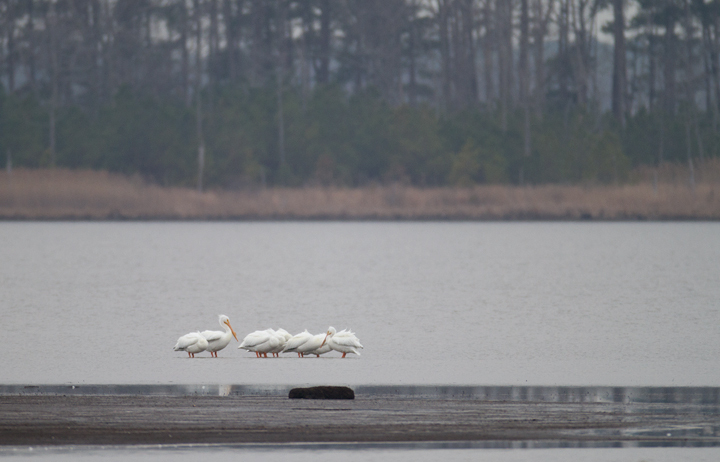 Below: American White Pelicans at Blackwater NWR, Maryland (1/22/2012). 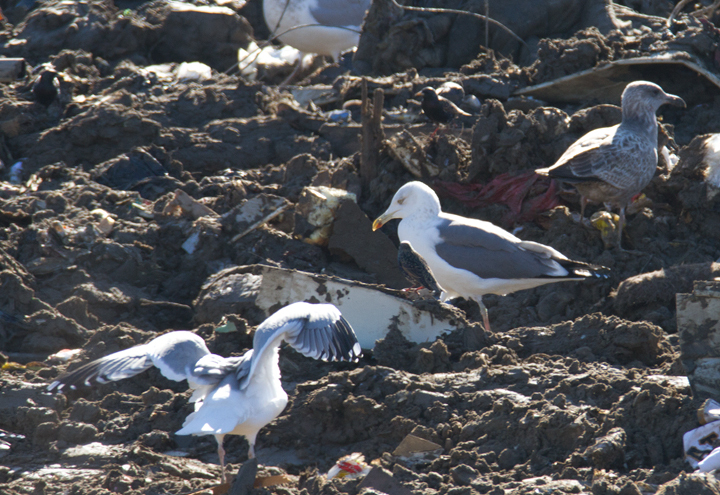 Below: A presumed Lesser Black-backed Gull x Herring Gull hybrid - Worcester County landfill, Maryland (1/28/2012). 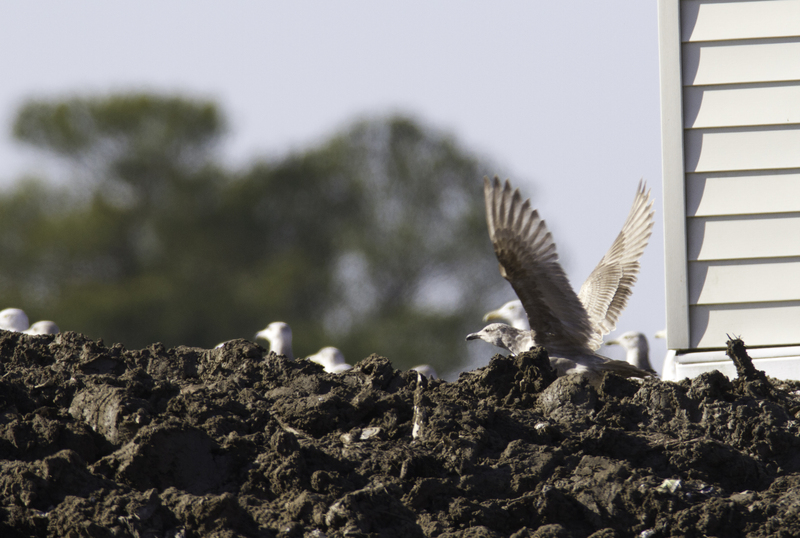 The harsh exposure in these images makes the mantle appear a bit darker than it did in the field. 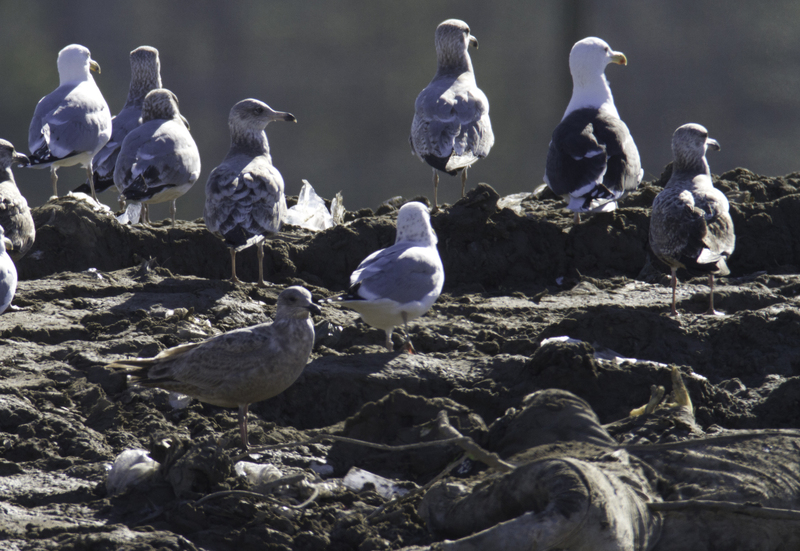 It appeared intermediate between American Herring and Lesser Black-backed Gull. 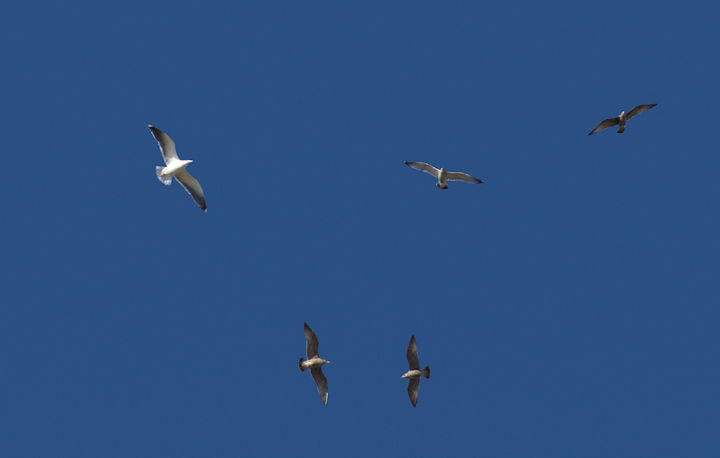 Below: Herring Gulls in flight over Salisbury, Maryland (1/28/2012). 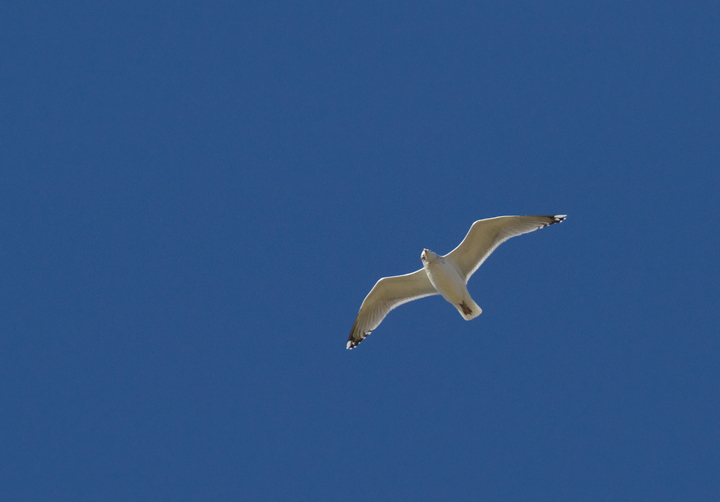 Below: An adult Great Black-backed Gull with Herring Gulls over Salisbury, Maryland (1/28/2012). 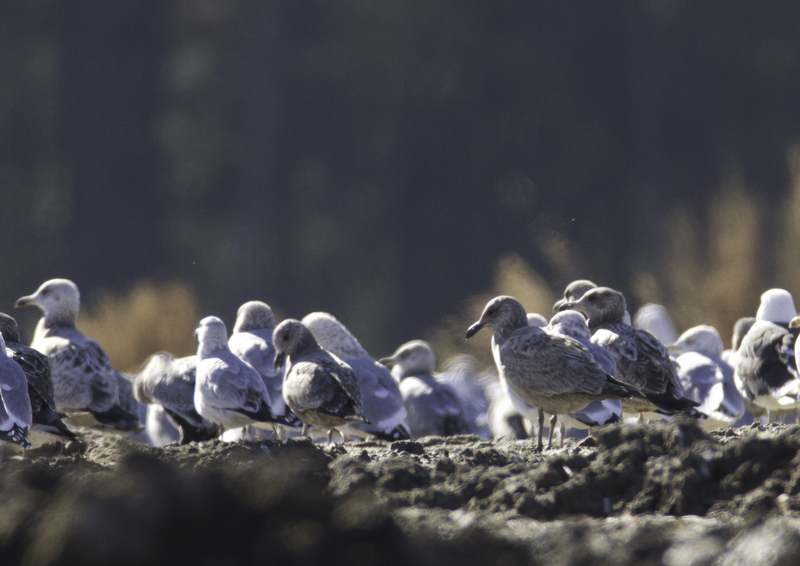 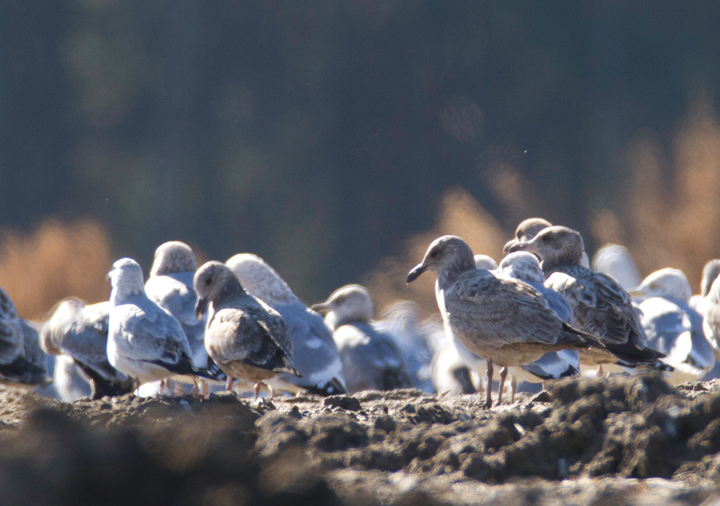 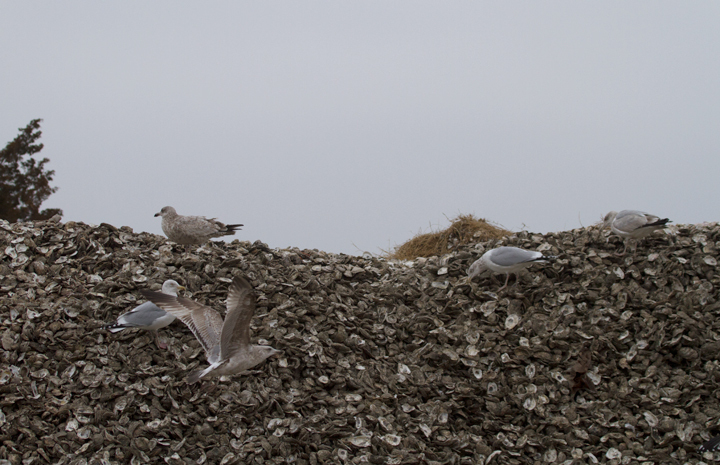 Below: An oyster hill in Crisfield, Maryland attracts some local gulls (1/22/2012). 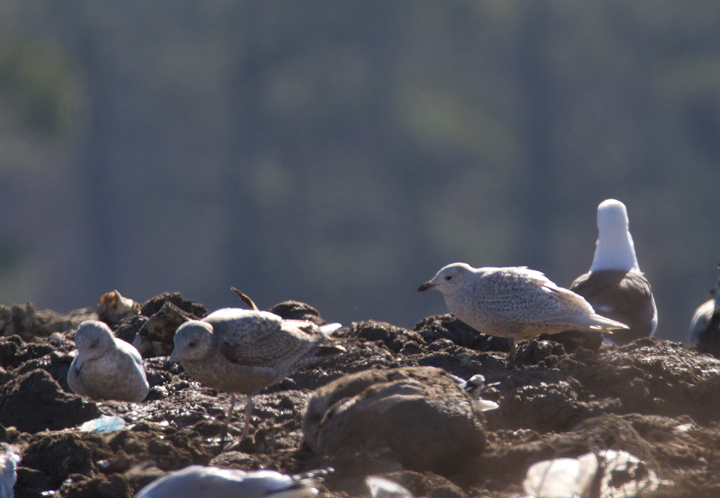 Below: A Kumlien's Iceland Gull in Worcester Co., Maryland (1/28/2012). 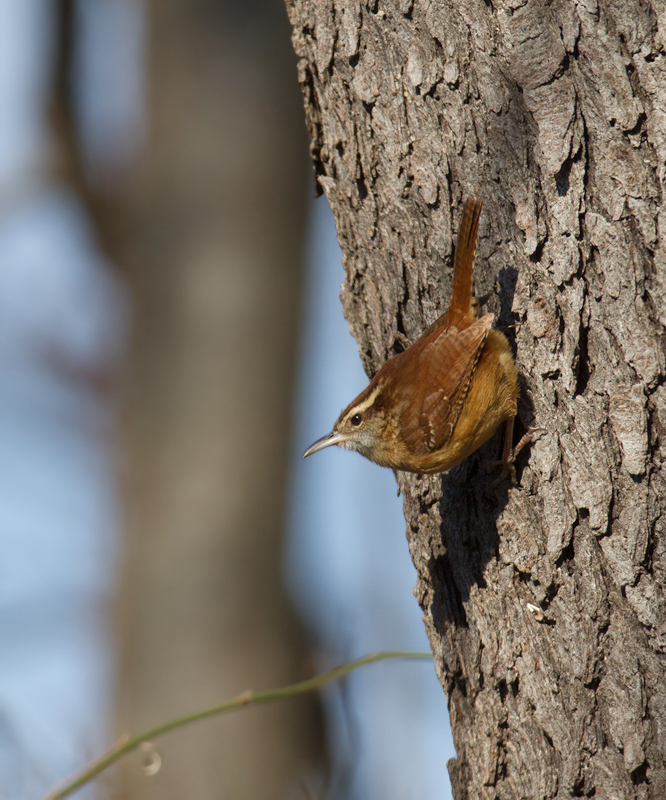 Below: A Carolina Wren in Calvert Co., Maryland (1/14/2012). 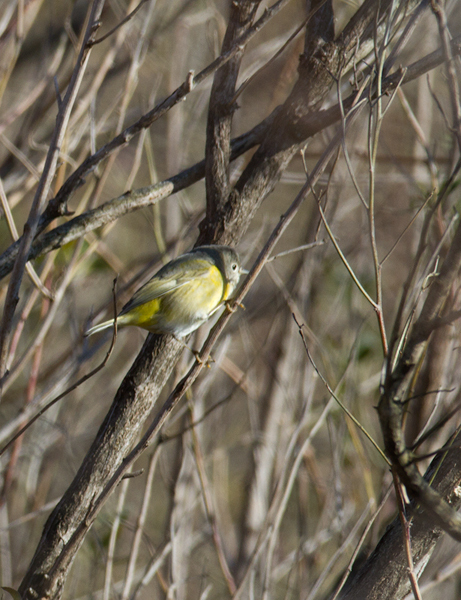 Below: A rare wintering Nashville Warbler in Calvert Co., Maryland (1/14/2012). 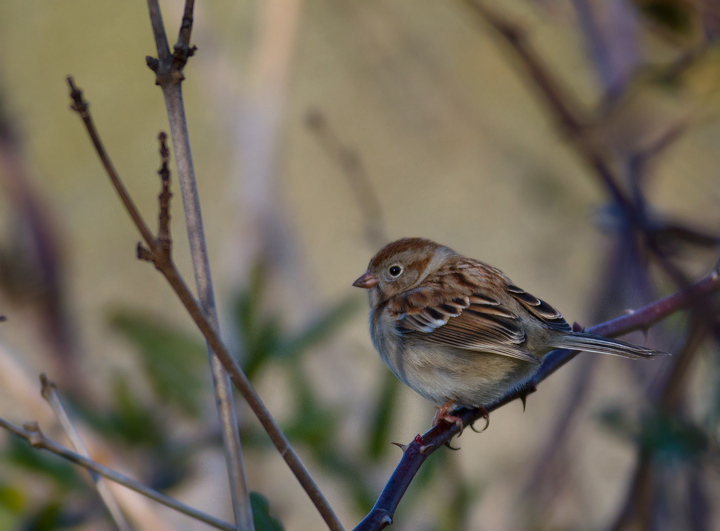 Below: A Field Sparrow in Worcester Co., Maryland (1/28/2012). 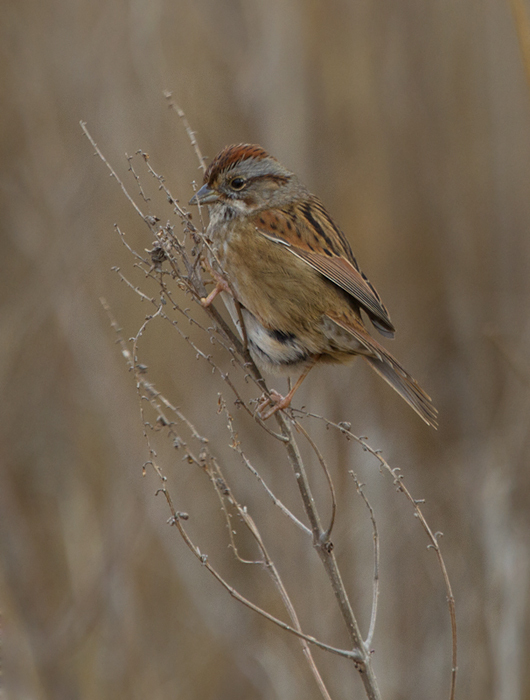 Below: A Clay-colored Sparrow continuing at E.A. 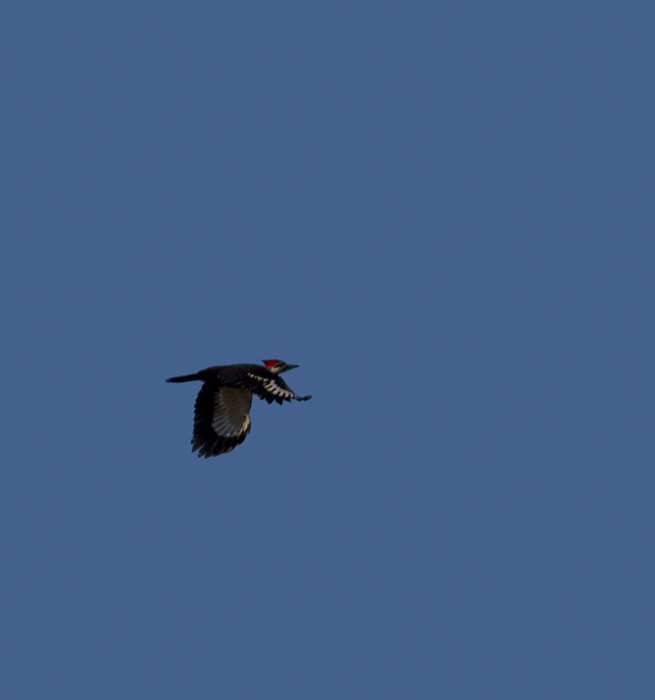 Vaughn WMA, Worcester Co., Maryland (1/28/2012). 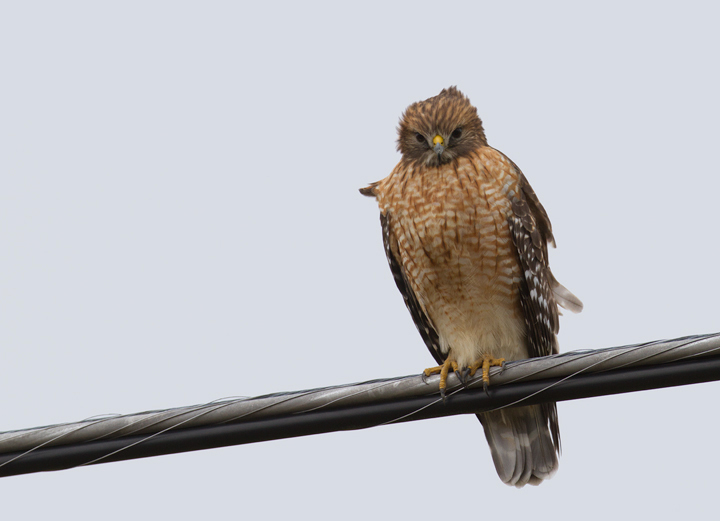 Found by Dave Czaplak on 1/1/2012. 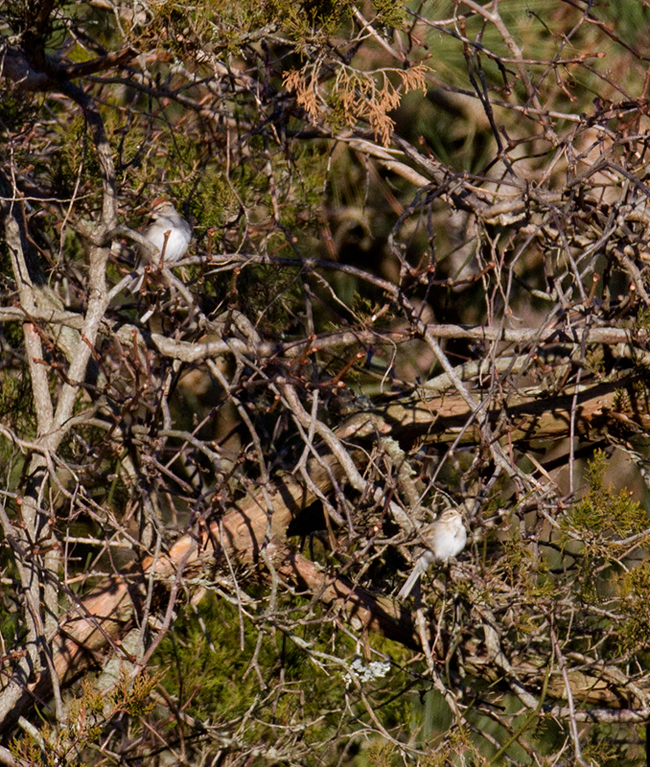 Chipping Sparrow above and left. 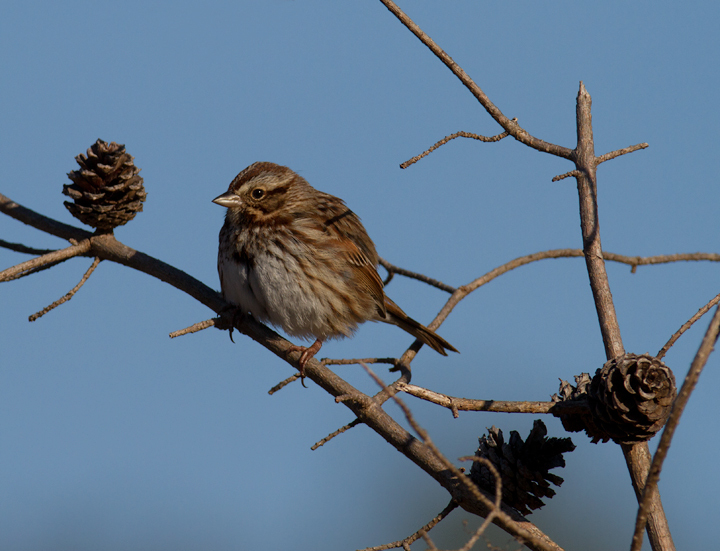 Below: A Song Sparrow at E.A. 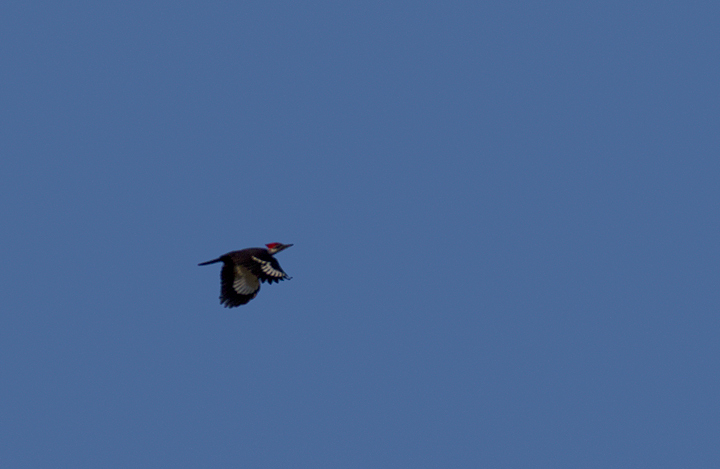 Vaughn WMA, Worcester Co., Maryland (1/28/2012). 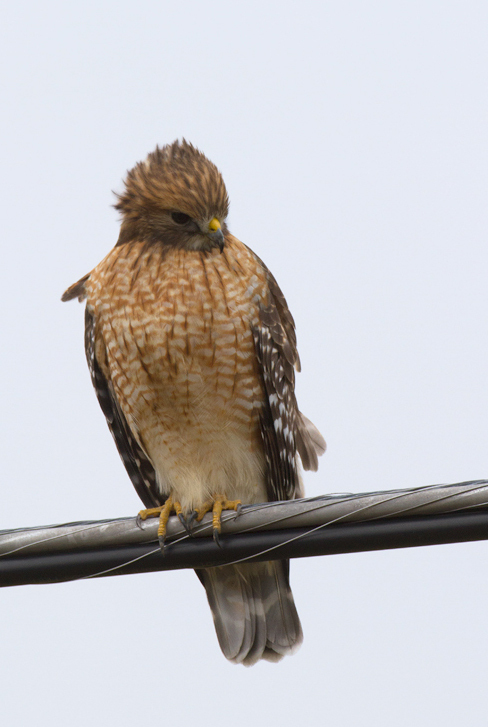 Below: An adult Red-shouldered Hawk in Somerset Co., Maryland (1/22/2012). 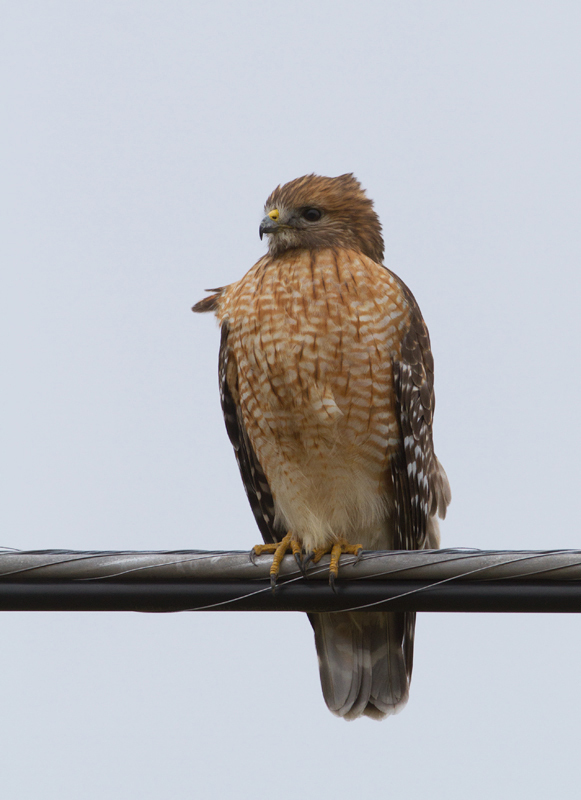 Locally uncommon.